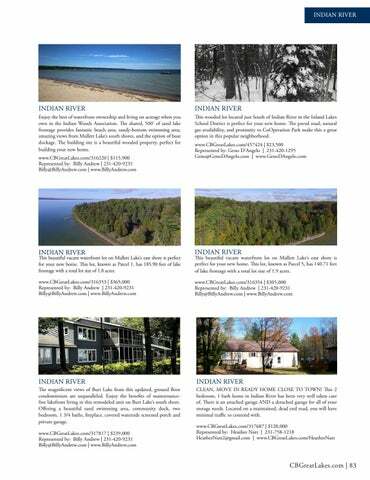 Enjoy the best of waterfront ownership and living on acreage when you own in the Indian Woods Association. The shared, 500’ of sand lake frontage provides fantastic beach area, sandy-bottom swimming area, amazing views from Mullett Lake’s south shores, and the option of boat dockage. The building site is a beautiful wooded property, perfect for building your new home. This wooded lot located just South of Indian River in the Inland Lakes School District is perfect for your new home. The paved road, natural gas availability, and proximity to CoOperation Park make this a great option in this popular neighborhood. This beautiful vacant waterfront lot on Mullett Lake’s east shore is perfect for your new home. This lot, known as Parcel 1, has 185.90 feet of lake frontage with a total lot size of 1.8 acres. This beautiful vacant waterfront lot on Mullett Lake’s east shore is perfect for your new home. This lot, known as Parcel 5, has 140.71 feet of lake frontage with a total lot size of 1.9 acres. The magnificent views of Burt Lake from this updated, ground floor condominium are unparalleled. Enjoy the benefits of maintenancefree lakefront living in this remodeled unit on Burt Lake’s south shore. Offering a beautiful sand swimming area, community dock, two bedroom, 1 3/4 baths, fireplace, covered waterside screened porch and private garage. CLEAN, MOVE IN READY HOME CLOSE TO TOWN! This 2 bedroom, 1 bath home in Indian River has been very well taken care of. There is an attached garage AND a detached garage for all of your storage needs. Located on a maintained, dead end road, you will have minimal traffic to contend with.